Ireland's Sam Bennett scored a hat-trick of stage wins at the Tour of Turkey when he soloed into Istanbul six seconds clear of the rest of the peloton at the end of yesterday's final stage. 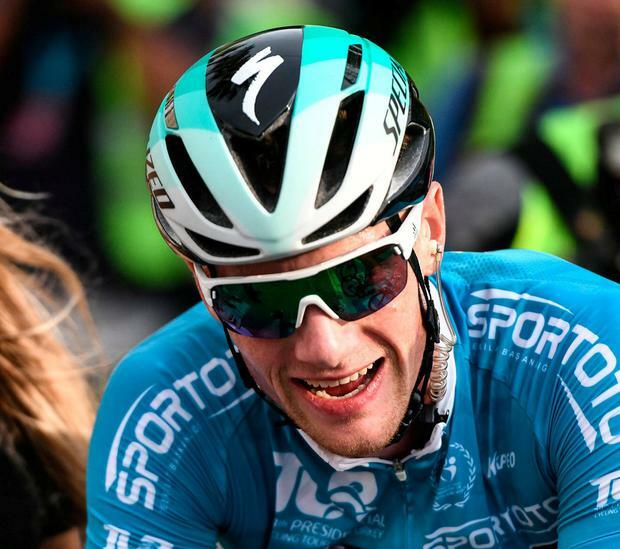 Known for his sprinting prowess, Bennett had already claimed stages two and three by mere millimetres in big bunch-sprint finishes but yesterday opted for a different tactic, one that caught his rivals napping and left him with plenty of time to put his hands in the air at the finish. In a twisting and undulating finale, instead of waiting for the sprint, Bennett seized the opportunity to jump clear with 1.5km to go and the Carrick-on-Suir rider was strong enough to hold off for a rare solo victory. "I know the finish here pretty well, so I made the jump and went hard on the hill as much as I could," said Bennett afterwards. "I knew if I did that, then I could recover around the corners." Because his previous two victories were so tight, Bennett didn't get time to put his hands in the air but he made up for that yesterday and clearly savoured the last few hundred metres. "That wouldn't have been possible today without the team," he said of his Bora Hansgrohe squad. "They were brilliant. The whole team came together to put me exactly where I needed to be before I attacked. "I can't thank them enough. It feels like I've managed to get some redemption after my crash here last year. "For that and the type of finish it was today, I think it was probably my favourite win out of any I've had." Bennett's third victory in the WorldTour race saw him go home with the points classification jersey while compatriot Nicolas Roche finished 10th overall, 10 seconds behind overall winner Eduard Prades of Euskadi.